The man of vision , who saw the beauties of this Mountain Highway and initiated it construction. 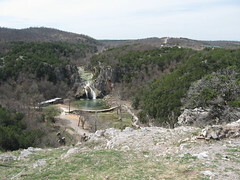 From Oklahoma City, continue South on I-35 and take exit 51 for Turner Falls Park. Continue up the mountain road until you reach the Overlook. 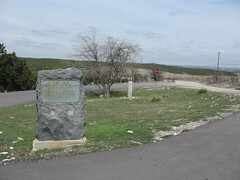 Monuments are on the west side of road. 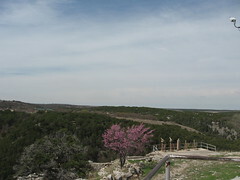 These views of Turner Falls are from a highway overlook. 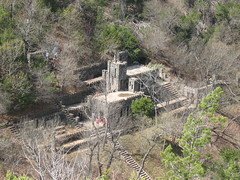 Most of the rockwork and trails in Turner Park were built during the 30's by the CCC*. The highway down to the park was also built during the Great Depression. By prison labor.